Many parents have questions about what they should do if and when this occurs. The first and most important thing to do is to try to calm your child down and attempt stay calm yourself…but we know that is easier said than done! If a permanent tooth is knocked out and is located, try to pick it up only from the crown (top) of the tooth, and avoid touching the root. If there is debris present on the tooth, you can rinse it gently with a small amount of water. If the permanent tooth can be placed back into its socket, then do so as soon as possible. This is the best way to try to save the tooth. 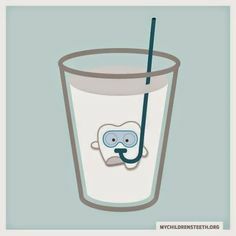 If replanting the tooth is not possible, then store the tooth in milk, tooth avulsion storage solution if on hand, or saliva. Call your pediatric dentist right away. An avulsed permanent tooth is a true dental emergency and care should be sought immediately. DO NOT try to replant the teeth–this can cause damage to the developing permanent tooth. Call your pediatric dentist. The dentist will most likely want to see your child to take an x-ray to ensure that the missing tooth has not been completely intruded (pushed up into the gums), to determine if only the coronal (crown) portion has been lost and evaluate for any root fragments remaining. This x-ray will also help to keep an eye on any potential complications that may occur to the unerupted permanent tooth, especially in children under the age of 3. If the avulsed tooth has not been located, a referral to a pediatrician may be needed to rule out that the tooth hasn’t been aspirated (swallowed or breathed in through the lungs).